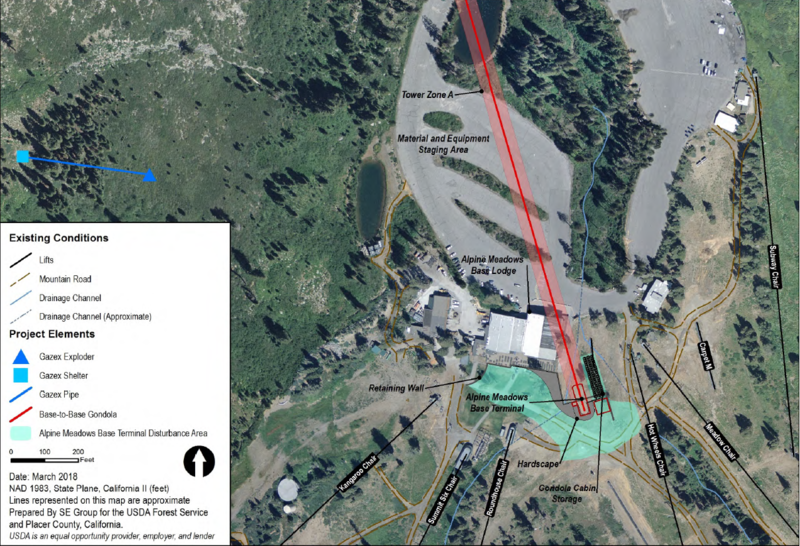 A 16 minute flight between Squaw Valley and Alpine Meadows took a jump forward this morning as the Truckee National Forest and Placer County released the draft environmental impact statement for the California Express gondola. 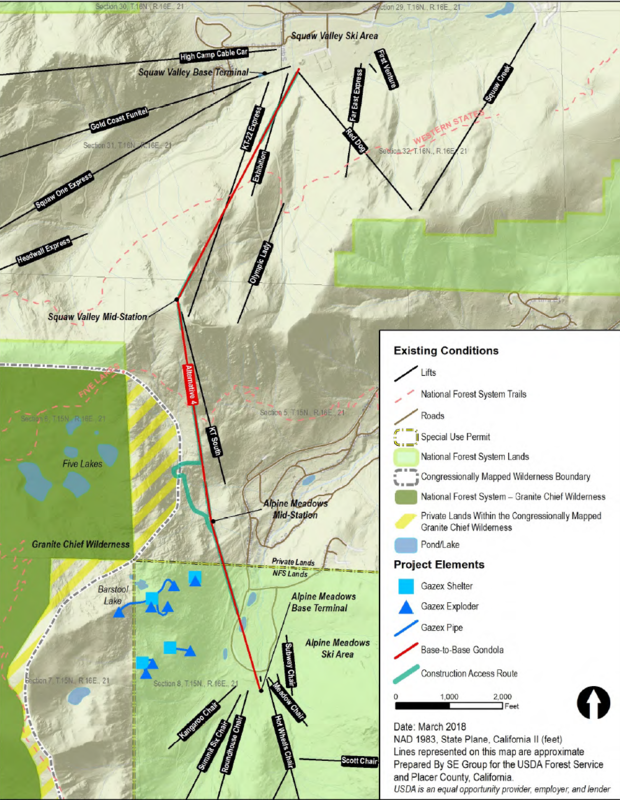 The big three stage lift was first proposed by the owner of both mountains, KSL Capital Partners, more than two years ago and is now being championed by Alterra Mountain Co. At 808 pages, the EIS required under the National Environmental Policy Act outlines three possible alignments which could unite the steeps and village at Squaw Valley with the beginner and intermediate paradise of Alpine Meadows. Two of the alternatives are new while the other two should be familiar to readers of this site. Other concepts such as a pulse gondola, expanded shuttle service and even an underground train were eliminated as part of the preliminary review, which was completed by SE Group and Ascent Environmental of Sacramento. Alternative 1 is the required no-action option, which would keep Squaw Valley and Alpine Meadows separate but equal. Shuttle buses would continue running every 30 minutes between the two mountains, which already share a common lift ticket. The lift would move 1,400 skiers per hour in 8-passenger cabins painted white to blend in with the winter environment. It would operate from 8:00 am to 6:00 pm with skiing allowed from the mid-station(s) when conditions permit. There would be separate drive systems and separate cabin parking facilities at each end so two sides could operate independently. 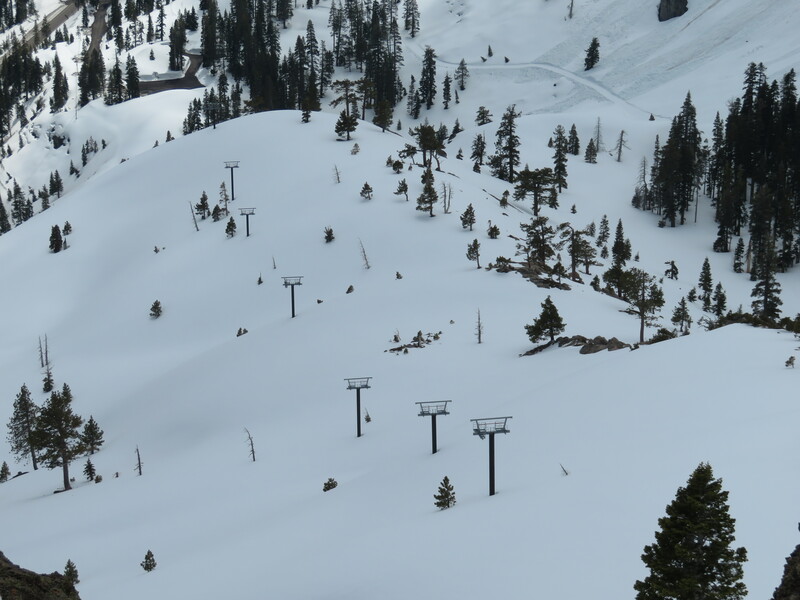 The middle section of the lift would operate as part of the Alpine Meadows side and approximately 40 percent of the cabins would be stored at Squaw Valley with the remaining 60 percent at Alpine during storm events and the summer. 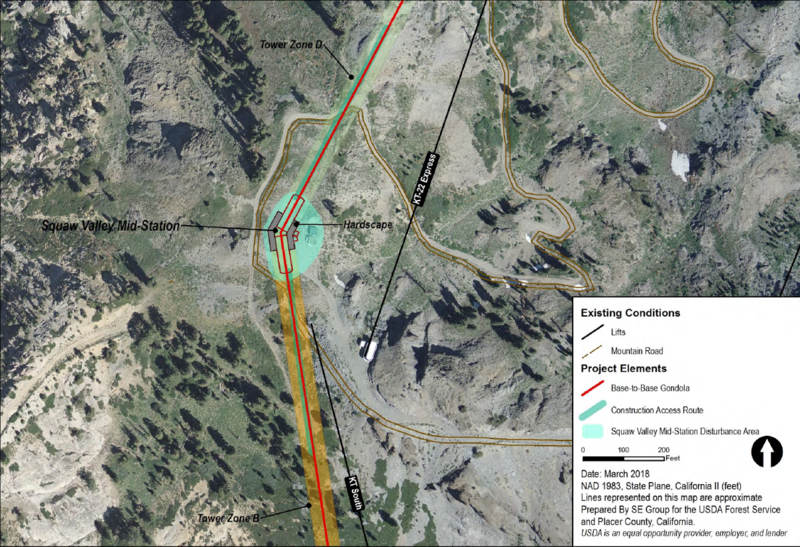 Alternative 2 is the one originally proposed in late 2015, stretching approximately 13,000 feet with 35 towers and two angle stations in areas known at the Buttress at Alpine Meadows and the Saddle at Squaw. During normal ski hours, guests could unload at either mid-station. 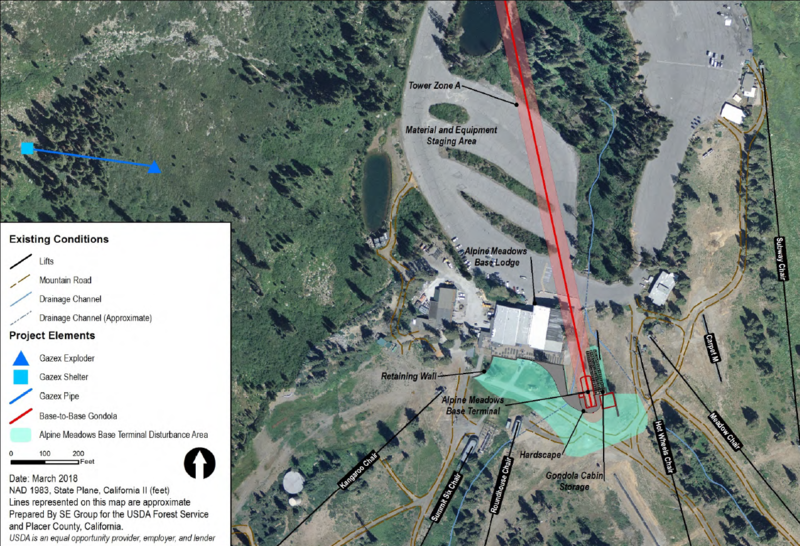 One drive terminal would be located beneath the Gold Coast Funitel and the other adjacent to the Alpine Meadows base lodge, which the gondola would cross over at 50 feet above ground. 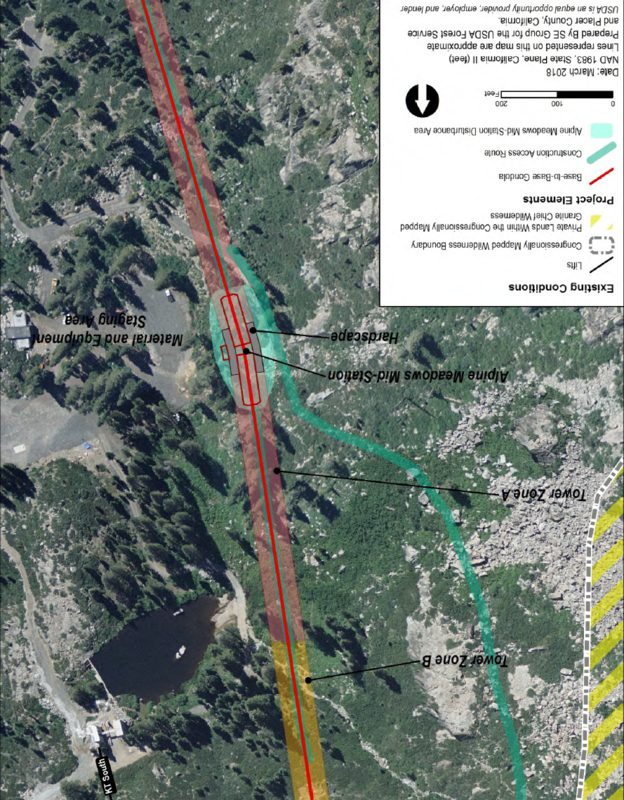 Eight Gazex exploders would be built to mitigate avalanche hazard along the line. 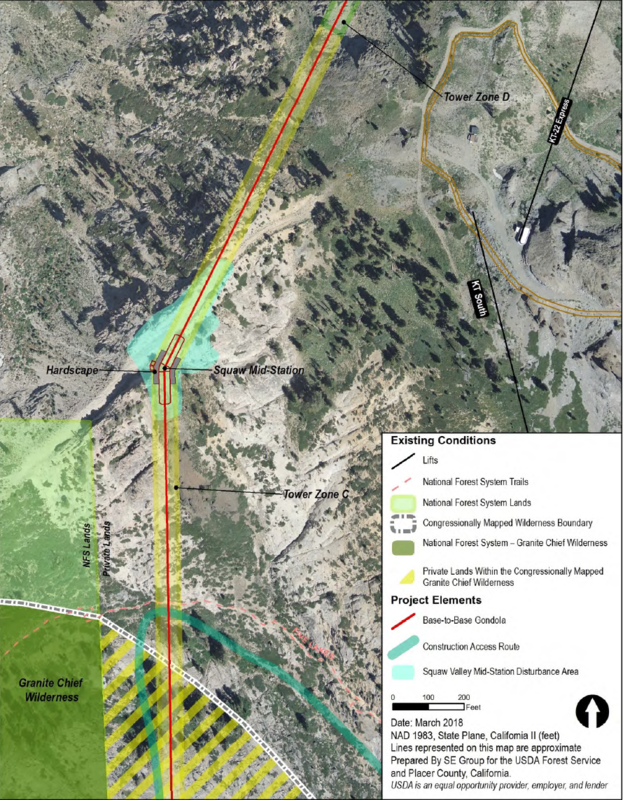 This proposal became criticized for its proximity to the Granite Chief Wilderness, with some noting the land for stage two was intended by Congress to become wilderness if the private landowner ever agreed to sell. More on that in a minute. Under Alternative 2, the Alpine Meadows angle station would be flown in by helicopter and operate with minimal power from a line generator. The Squaw mid-station could be reached by road but would also be minimally powered. Under this alternative, a double grooved bullwheel could allow the middle stage to run off of motion derived from the Alpine Meadows base area, which would be pretty slick. The all-new Alternative 3 moves the lift to the east with the Alpine Meadows angle station now on private land owned by Troy Caldwell, known as the White Wolf property. This is the guy who partially built a private chairlift shown on the below maps as KT South. The storied White Wolf lift seen from the legendary KT-22 lift. The Squaw angle station would remain in the same location on the Saddle with the same Gazex exploders required as with Alternative 2. The lift would be 12,600 feet long with 34 towers. 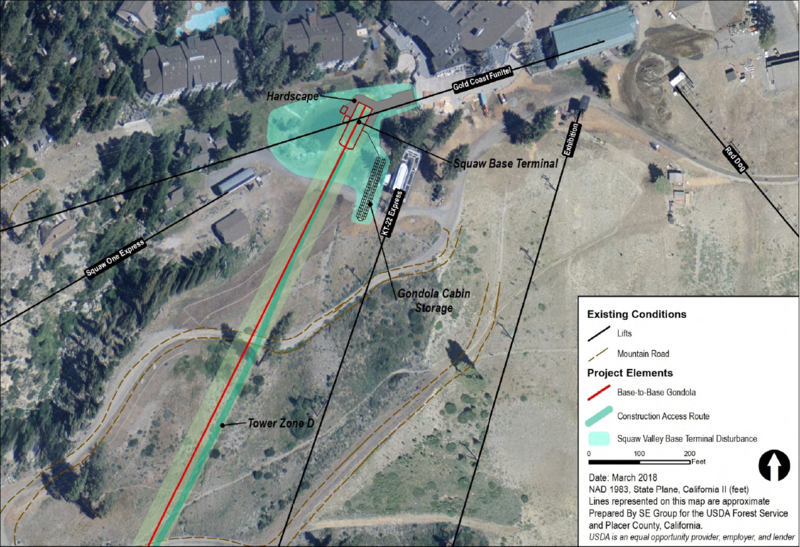 Under this scenario, riders would not be allowed to exit at the Alpine Meadows mid-station with the exception of owners and guests of 38 units Mr. Caldwell proposes to build on his property. Talk about a real estate gold mine but less appealing to the rest of us skiers. 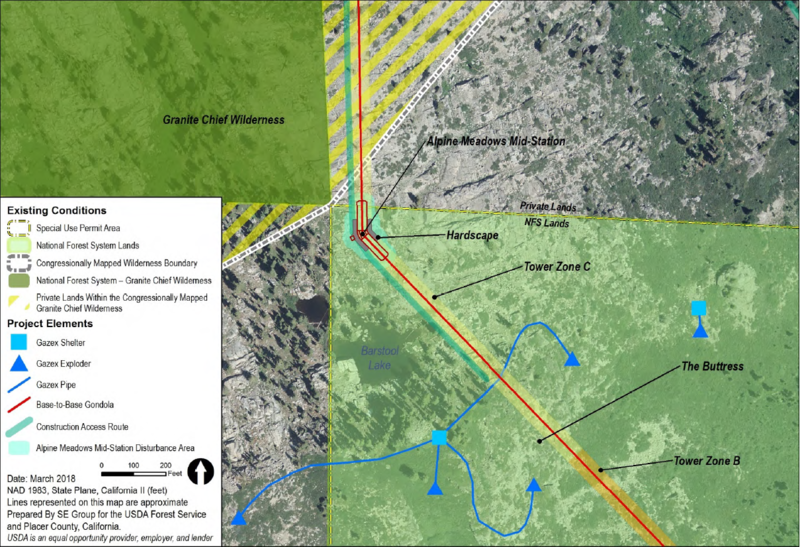 The gondola would be 11,700 feet long under Alternative 4 and located even further east. 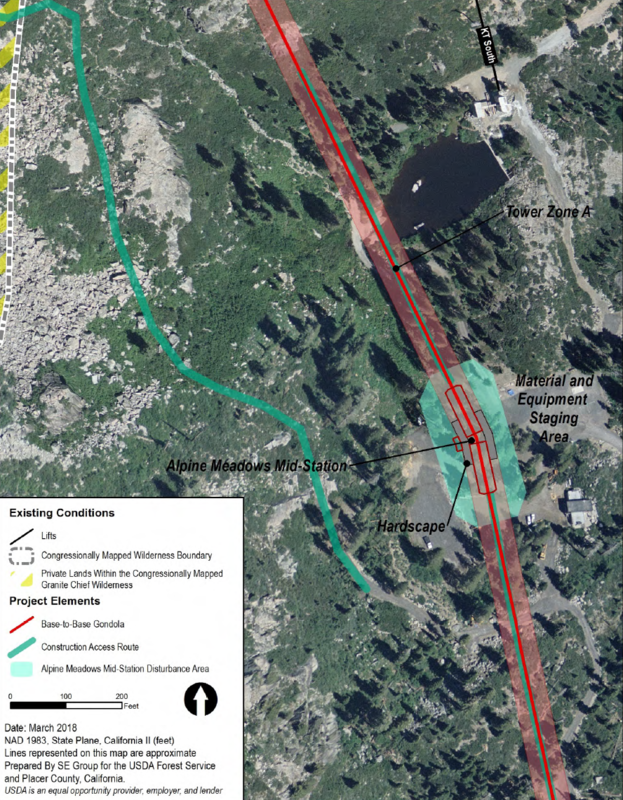 The Alpine angle station would again be on White Wolf land with the Squaw mid-station occupying Squaw-owned land on a slightly different part of the Saddle where KT-22 used to unload. The second stage would roughly follow the alignment of Mr. Caldwell’s partially-completed fixed-grip and the third stage would cross over both the KT-22 Express and Exhibition lifts. Red Dog‘s bottom terminal would likely need to move to make way for the gondola drive station. The three stages would meet at less sharp angles under this scenario, which could allow for horizontal sheaves to turn the line above Alpine Meadows rather than bullwheel(s,) meaning one less haul rope loop. 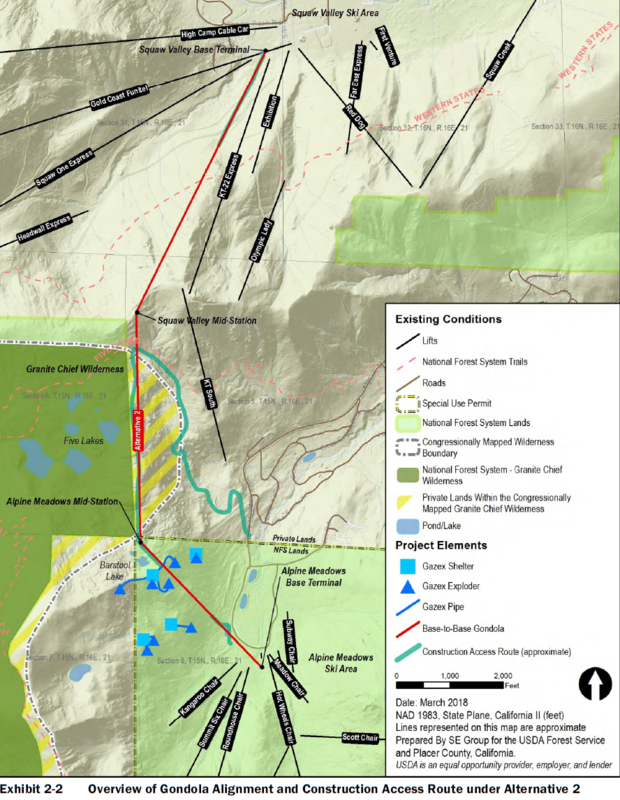 Under all three alternatives, less than a third of the lift’s length and no more than two stations would occupy National Forest system lands. 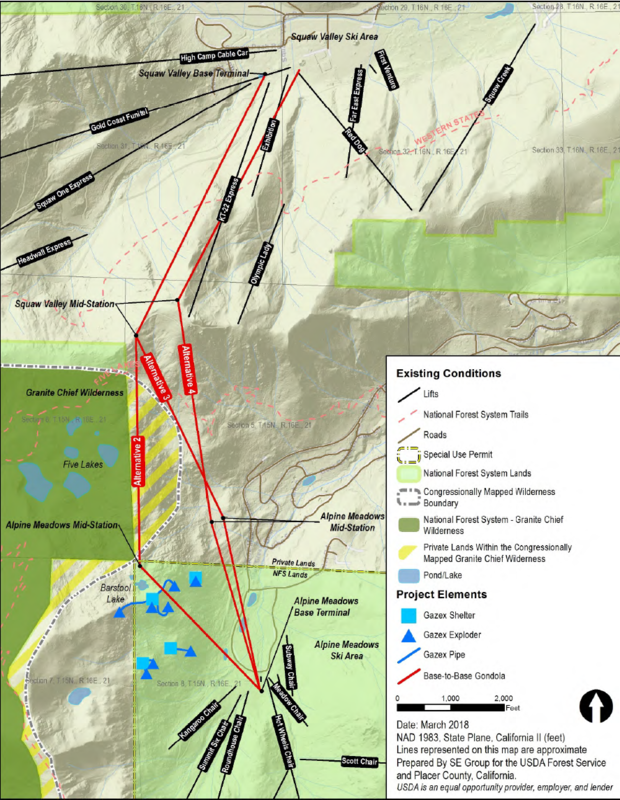 The document notes that alternatives 3 and 4 generally would have less environmental impact as they are further from the Granite Chief Wilderness and Five Lakes areas. Numbers 3 and 4 would also provide easier ground evacuation routes in case of a serious mechanical failure. Alternative 3 is believed to have the least impact on aquatic habitats, associated wildlife and botanical species while Alternative 4 requires the least ground disturbance and tree removal. On the other hand, Alternative 2 would have the lowest avalanche risk being closer to the ridge line. As stakeholders weigh all of these issues, the next few months will be critical. 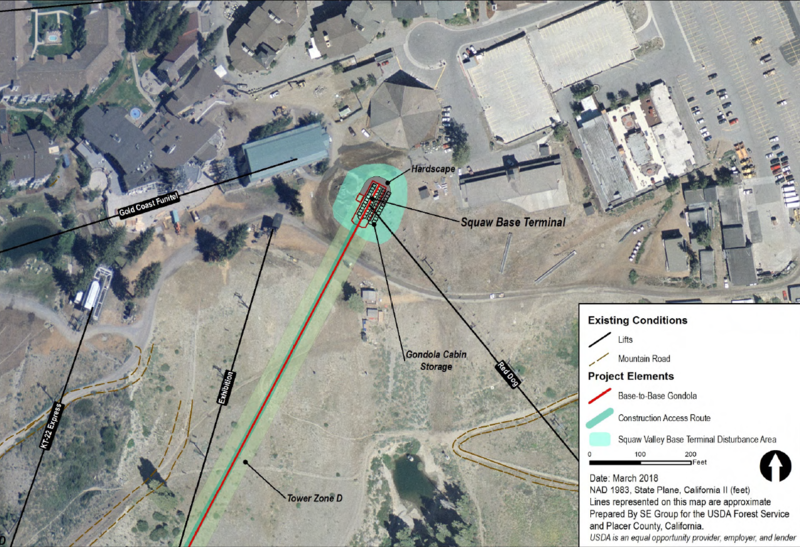 You can submit your thoughts here through June 11th and there will be public open houses in Truckee and Kings Beach on May 22 and May 24th. The Forest Service expects to make a decision around March 2019. I like Alternative 4 the best. Be able to provide much needed relief to the KT-22 lift. Can anyone elaborate on the White Wolf lift? I cannot find anything on it and have never really understood what happened. It’s an epic story of a liftie done good, definitely not done justice in this wiki. Lots available when you google white wolf tahoe. I can see an issue in Alternative 2 of novice skiers unloading at the Buttresses unknowingly atop all extreme terrain and thinking they could ski down. The operators would need to be actively vetting skiers and riders unloading at that station for their abilities, or better yet have no unloading at that station. 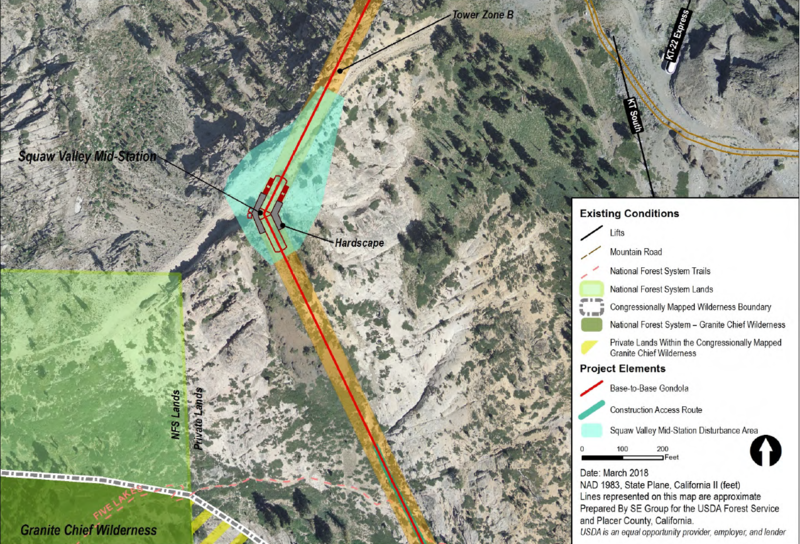 Call it a theory at this point, but I believe Squaw/Alpine is headed towards Alternative 4 because there is a new project to realign Red Dog referenced on July verzion of the CEQA PDF at the county planning site below. More support for Alternative 4 for the Gondola. Lots more detail on new proposed alignment for Red Dog. 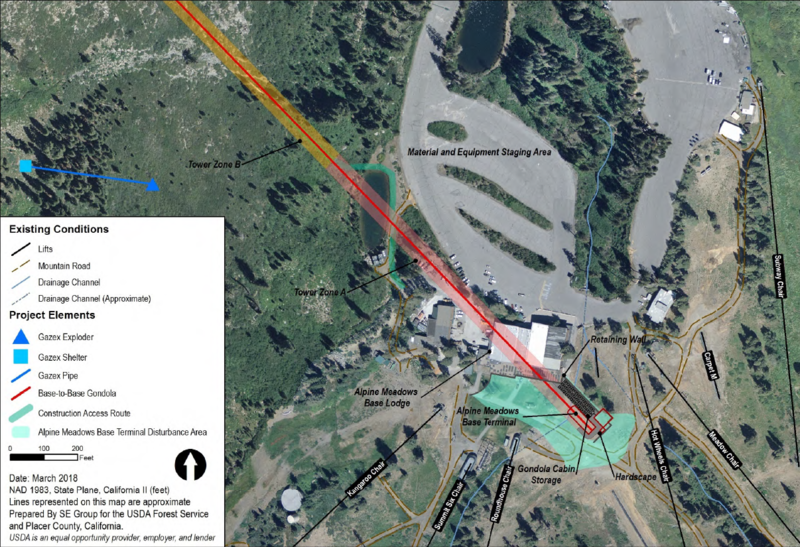 The new base terminal is going to be placed in approximately the same location as the original Red Dog chairlift.